In the Marvel Universe, the technologically advanced fictional African nation of Wakanda is home to one of the most elite fighting forces — the Dora Milaje, who the world at large got to know earlier this year thanks to the runaway success of Marvel Studios’ Black Panther film. The women who make up their ranks are tasked with protecting the country, its supply of the mineral known as Vibranium and the Black Panther — the county’s wise and powerful king/national superhero, with a penchant for becoming embroiled in high stake danger. The Dora Milaje were introduced in 1998 by Christopher Priest and Mark Texeira, and since then have fought side by side with their king in a number of comics, before appearing in live-action in this year’s Black Panther and Avengers: Infinity War This month, they’ll graduate to their own miniseries that teams several fan-favorite members of the Dora Milaje with some of the Marvel Universe’s most iconic heroes. 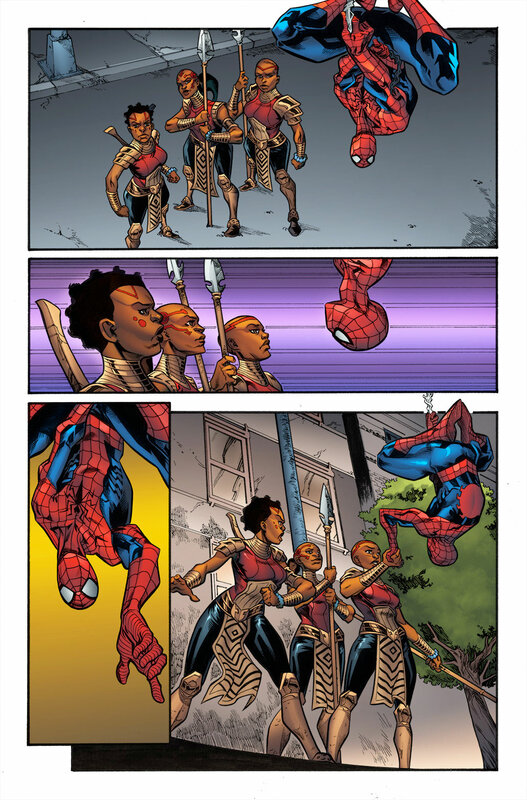 It all begins in Amazing Spider-Man: Wakanda Forever by novelist Nnedi Okorafor and artist Alberto Jimenez Alburquerque. The action continues in July’s X-Men: Wakanda Forever by Okorafor and artist Ray-Anthony Height, and concludes in August’s Avengers: Wakanda Forever by Okorafor and artist Oleg Okunev. CBR spoke with Okorafor about her protagonists, guest star heroes and the antagonist they’ll work to defeat — the comic incarnation of Nakia, who is very different from her Marvel Cinematic Universe counterpart. CBR: Wakanda Forever takes three prominent members of the Dora Milaje away from the usual characters and environments they regularly interact with, and those characters — Okoye and the Midnight Angels (Ayo and Aneka) — have all had some pretty strong arcs in Ta-Nahesi Coates’ Black Panther run and Roxane Gay’s World of Wakanda series. What do you find most interesting about these characters? Nnedi Okorafor: This Wakanda Forever storyline is pretty action packed and I enjoy the challenge of characters being characters, even when in action. They each react to situations as only they would. I really got to know Okoye, Ayo and Aneka each on an individual level while writing this, but also how they move in formation. What I find interesting about Okoye, especially, is that she is tough, loyal, controlled and straight-edged, yet at the same time capable of great compassion. With Ayo and Aneka, you have to pay very close attention to see those moments where even a small gesture or comment says a lot about what each thinks of a situation. I really enjoyed those subtle details. It looks like the primary antagonist of your story is former Dora Milaje, Nakia, aka Malice. She too is a character who has quite a bit of comic history attached to her. So what’s your sense of Nakia? What made you want to use her as a foe in this story? Yes, let me say up front that this Nakia is the Nakia of the comics, not the film. And it must be understood that the Nakia of the comics is very different from the one in the film. She has a whole history, one where she’s… been through a lot. When this story opens up, the Nakia we meet is broken from all that she’s endured and done in the past. She was a Dora Milaje who went wrong and Okoye, Ayo and Aneka have to face this one who used to be one of their own. To be honest, Marvel especially wanted me to deal with Nakia/Malice. Once I took a really close look at her, I knew I wanted to dig into her all the way down to what makes her tick. I love writing complex, flawed characters and Nakia/Malice was a hot mess. 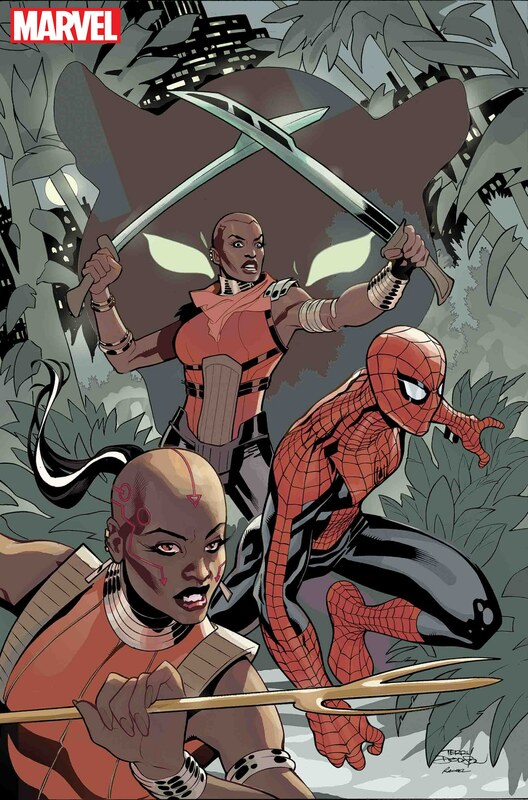 The post Okorafor Teams the Dora Milaje with Marvel Icons in Wakanda Forever appeared first on CBR.